Evergreen Capital Partners has increased its interest in Energy Action from 7.1 to 9.3 per cent. ERM Power said it set new records for customer satisfaction in the 17th annual Utility Market Intelligence (UMI) survey. ERM Power scored a record 93 per cent for overall customer satisfaction among business customers, compared with an average of 52 per cent for the five other major retailers. 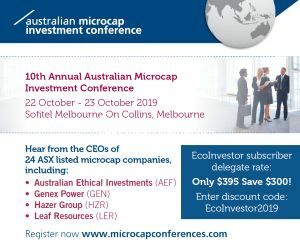 At, $1.79, the unit price for Australian Ethical Smaller Companies Trust has reached its highest level since April 2011 when they touched $1.81. Will Infigen Sell Its Australian Wind Farms? Infigen Energy has responded to an Australian Financial Review article about the potential sale of its Australian wind farms, saying it is looking at a range of options to improve its financial flexibility. The AFR article said Infigen is considering sales to ease its $1 billion debt burden, but would remain the operator of any farms it sold. It quoted managing director, Miles George, as saying Infigen has fielded inquiries from parties interested in its six local wind farms but has no timetable for making any decisions. We know that we need to do something other than just operate the assets efficiently in order to escape from the problems of having a high level of leverage, quoted The Australian Financial Review. Mr George said Infigen wanted to reduce its leverage so that the ratio between debt and earnings before interest, tax, depreciation and amortization fell to about four times, down from seven times. That would see gearing  the ratio between debt and debt plus equity  fall from about 70 to about 50 per cent. It would involve a debt reduction of roughly $500 million. Carbon Conscious raised $339,500 under its share purchase plan. 6,790,000 shares were subscribed for, leaving a shortfall of 17,210,000 shares. CO2 Group is to acquire the independently operated Ecofund Queensland Pty Ltd from the Queensland Government. Established in 2009, Ecofund is Queenslands leading provider of transaction and advisory services across carbon, environmental offsets and renewable energy markets. It has protected over 100,000 hectares as national parks and environmental offsets for blue chip clients. Ecofund is one of Australias largest traders of voluntary carbon offsets and will complement our well established offerings in project management, environmental trading and carbon advisory services, said Andrew Grant, chief executive of CO2 Group. The acquisition underscores our commitment to deliver a full range of environmental services, said Mr Grant. Shares in Ceramic Fuel Cells (CFCL) fell to a low of 4.5 cents on 6 March, a day after it announced it was temporarily suspending its distribution agreement with German company Sanevo. This was due to Sanevo being placed in insolvency administration. CFCL said it fully provided for any expected loss that may arise in its half year report. Talks on continuing with a potential legal successor company are pending. With a new focus on the propagation and harvesting of Hiramasa Kingfish, Clean Seas says it is increasing production from 500 to 3,000 tonnes per annum over five years, and that it expects to be profitable from around 1,100 tpa. Clean Seas has farmed Kingfish for over eight years. It says it is the only reliable producer of Kingfish fingerlings globally, and maintains a pool of genetically improved and genetically diverse broodstock for spawning. Its existing infrastructure will support the planned expansion. Funding for the expansion of production is expected to come from a combination of cash, further asset sales, joint venture arrangements under consideration, and new equity. Clean Seas has established markets for premium grade sashimi Kingfish in Australia, Asia, America and Europe. Orbital Corporations sale of 12 per cent of Synerject to partner, Continental Corporation, for $5.8 million was not an easy one, said chief executive, Terry Stinson. It was driven by the liquidity issues facing the Group, as highlighted by the auditors emphasis of matter note in our 30 June 2012 annual report which explained the uncertainty of the Group continuing as a going concern. The Synerject investment was never really controlled by Orbital, and it could not easily be sold to any party other than Continental. Ultimately Continental may itself want to be the 100 per cent owner, he said. Lynas Corporation is to replace its chief executive, Nicholas Curtis. From 31 March, Eric Noyrez will join the board and become the new chief executive officer. Mr Curtis will remain as non executive chairman and focus on strategy development and the development and implementation of Lynas Shared Value program. Liam Forde will be deputy chairman. He has been a director since December 2007 and also the lead independent director. Mr Noyrez has a detailed knowledge of the international rare earths and chemical industries, and led the operational implementation of the Lynas Rare Earths project. Before Lynas, he spent nine years with Rhodia, a French chemical group, and was president of Rhodia Silcea, and a global supplier of products that use rare earths and rare earths technologies. Carnegie Wave Energy has established a UK subsidiary, and made high profile appointments to its board. It also said construction of the Perth Wave Energy Project will begin next month to deliver green energy to Australia's electricity grid early in 2014. The project will be Australia's first commercial wave energy project connected to the electricity grid, and the associated wave powered desalination plant will be a world first. The project will provide up to 2 megawatts of power, enough for the equivalent of 1,000 houses, and reduce carbon dioxide emissions by up to 3,500 tonnes per annum. Chief executive, Dr Michael Ottaviano, said "The beginning of construction of the Perth Wave Energy Project is a significant moment in the Australian energy industry. The green project will encourage Australian investment and jobs in manufacturing, engineering and infrastructure. Australia is at the cutting edge of the global marine energy sector, which the UK Carbon Trust forecasts will be worth $760 billion by 2050." Carnegie's new subsidiary, CETO Wave Energy UK Ltd (CWE UK), will be based in Edinburgh, Scotland and will run all Carnegie's UK activities. Allan MacAskill will join its board, along with UK-based John Leggate, Dublin based Kieran O'Brien, and Carnegie directors Grant Mooney and Michael Ottaviano..
Carnegie said the UK is considered to be the hub of global wave activities and has cordinated commercialization support including feed-in tariffs, capital grant support, offshore testing infrastructure, legislative and regulatory support and offshore wave project leasing rounds. This support has led to significant industrial activity from power utilities, equipment suppliers and players in the supply chain. Mr MacAskill has over 20 years of energy industry experience in offshore oil and gas and offshore wind in the UK and North America. He conceived and developed the Beatrice offshore wind demonstrator project in Scotland which pioneered large-scale windfarms in the deeper waters in the UK and was the coordinator of Europe's largest renewable energy R&D program. He founded SeaEnergy Renewables which built an offshore wind pipeline portfolio of 3325 MW in the UK, and is currently a director of Scottish Renewables, Scotland's main renewables industry body. Enerji has received an order from an ASX top 200 mining company for installation preparation of a waste heat to power system at one of its gold mines in the Asia Pacific. For an agreed initial fee, Enerji will undertake the first stages of design and planning and prepare a construction contract. The mining company understands the advantages of the Enerji system and wants to reduce its diesel consumption and CO2 emissions, said Enerji chief executive, Greg Pennefather. It will be the first mining company in the world to have a waste heat to power system (WHPS) of this nature. It is estimated the WHPS will save over a million litres of diesel and thousands of tonnes of CO2 every year. The contract comes after a site visit and assessment last year by Enerjis personnel, including Mr Pennefather, and subsequent proposal and commercial negotiations. Liquefied Natural Gas has signed an exclusive Site Lease Option Agreement with the Lake Charles Harbour and Terminal District Authority for its proposed Magnolia LNG Project at Louisiana in the US. The binding Agreement gives LNG exclusive rights to the project site and time to obtain all necessary approvals prior to committing to the full terms of the Site Ground Lease.